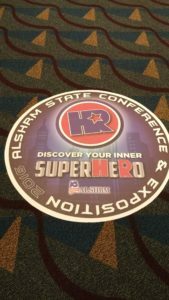 The 2016 AL SHRM State Conference is over and I felt I came away with a lot of good information. I also had a great time getting to meet and socialize with other HR professionals from across Alabama. And isn’t that the reason we go to conferences? It’s not for the free swag, or the free food/drinks, or even just the time off from work. We go to conferences because we want to keep our HR skills sharp and want the chance to network/socialize with the only other people who can understand what we face everyday. * I wish there had been free Wi-Fi available for attendees. 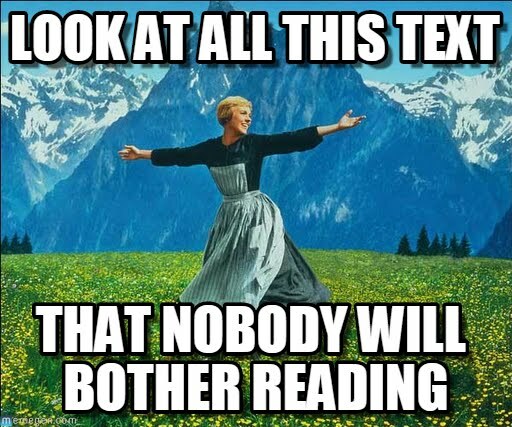 I know we all have phones, and tablets, and Mi-Fi, etc. I know Wi-Fi can get expensive for conferences. But it’s 2016 and if you truly want you conference to have an active social media presence, you need to have free Wi-Fi for attendees as a minimum. * It’s great that they had a conference app (more of a website) with the schedule, speaker information, and where attendees could access the speakers presentations after the conference. When you aren’t worried about writing down every word, you can focus and engage with the topic and the speaker. It makes for a better learning experience. 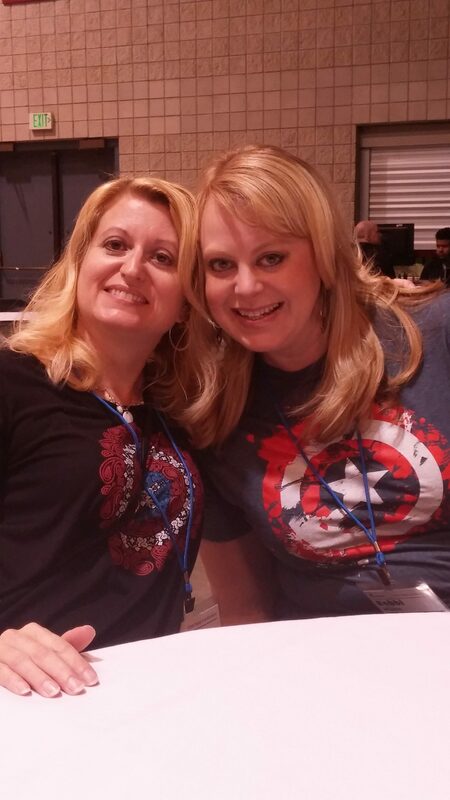 * The best part of the theme of HR superheroes was how everyone really got into the spirit of it. From the organizers, to the speakers, and even the vendors, there was a consistent message that felt authentic. People were excited about and engaged with the theme on their own and that always makes for a better and more memorable experience. * It’s a shame that the first day wasn’t better attended, though there were still a lot of people there, because I thought the legal seminar (Matthew Cannova) and the diversity speaker (Marlin Smith) were really good. With the first day being only a half day, it has more of a pre-conference feel that makes you think it is optional. Making the first day a full day instead would help draw in the crowds and give them the opportunity to have more content. * Matthew Cannova kept the whole audience calm, even when they started hyperventilating over the Transgender Bathroom laws topic. In fact, Matthew had some great information about OSHA & the EEOC that I hadn’t heard before. I appreciate that his approach was more about realistically understanding the risks. Don’t be afraid or react out of personal beliefs; do what is best for your business and plan accordingly. * Marlin Smith did a great job demonstrating how diversity is not just about race. He defined it as the subtle differences between people, and even the differences between people in the same groups. I loved that his view was more encompassing and addresses the broader issues of diversity. It is not about polices and training; it’s about making sure that all your employees feel welcome, understood, appreciated, and respected. * I feel shorter sessions on the second day would give attendees more learning opportunities. If you are like me and you hate to walk out in the middle of a session, you end up taking a gamble that the one you picked meets your needs. Also, shorter sessions are easier to sit through and remain focused. * Laurie Ruettimann saved the day like a true HR superhero when she stepped in to deliver Tim Sackett’s Keynote when he was unable to come. It certainly helped that Tim’s presentation on HR Math and Analytics was on point, but what I love about hearing Laurie speak is the passion she conveys and how encouraging she is. When she is done you want to stand up and be an HR superhero too. Whew, that was a lot to talk about and I didn’t even get into everything. Overall, I am happy to see AL SHRM do such an amazing job. All the organizers and volunteers were helpful and nice and worked so hard to put together a conference any state would be proud of. 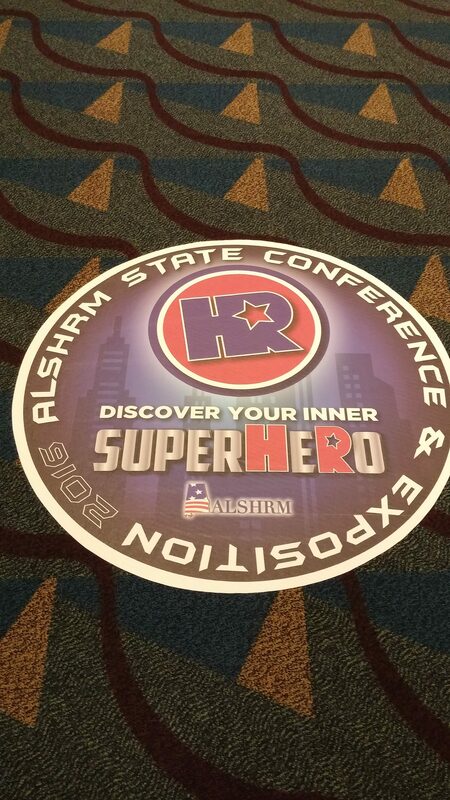 You can tell how devoted Alabama HR professionals are to elevating the HR profession here in AL and in general. I can’t wait to see what they have in store for next year. We are entering the conference season and there are a lot of opportunities out there for you to geek out with thousands of your fellow HR pros. Whether you attend for the continuing education credits, to stay up to date on legal changes, or even just for the free swag and networking; you can find a conference to meet your needs. Even if you attend multiple conferences a year or if you only get to one every few years, it’s important to be sure you are getting the most out of each experience. 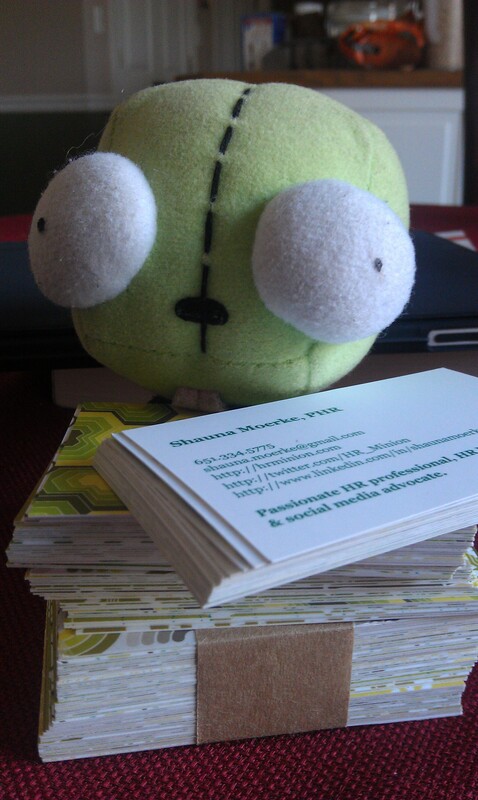 Gir has all his business cards ready! 1. Don’t bring your whole life with you. I don’t want to see roller bags people. Everything you bring you have to cart around with you all conference long in addition to all that free swag and conference material you are going to pick up. Save yourself some back pain. 2. Eat actual food and drink lots of water. It can be tempting to skip the meals and just eat junk in order to get things done. It’s also easy to forget to drink water and it’s too easy to overindulge in the happy hour/networking events. Don’t forget to take care of yourself. 3. Talk to your neighbors. Get to know the people standing next to you in line to check in. Chat up the crew hanging by the coffee. Get into a meaningful discussion with your seat mates while waiting for the keynote to start. Exchange cards with everyone at your lunch table. And so on. Just don’t hang with your co-workers and never talk to anyone else. 4. Don’t focus so much on taking notes that you forget to listen. A lot of us attend these conferences to bring back information for our colleagues at the office so we feel like we have to capture as much content as we can. But in the process you can fail to actually understand the content in a meaningful way or even enjoy the presentation. So sure, take some notes to help jog your memory later, but spend most of the time actively listening and thinking about the content that is being shared. Besides, a lot of presenters share their presentations, or will if you ask. 5. Give feedback. You know all those speaker evaluation forms? Presenters really appreciate them and use them to get better. Are you active on social media? Participate online by sharing content. Know of a great speaker you’d like to see, content you are interested in, or things that would have made to conference better for you? Submit your comments to the conference organizers. The only way to make the conference experience better is to share your feedback. 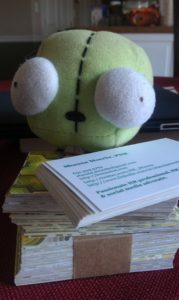 Conferences aren’t all about free drinks and free stress toys. Nor are they just an excuse to take a mini vacation to Vegas or Orlando. You get what you put into conferences so be sure to go into it prepared. I’ll see you out there, HR pros and remember, badges off before you hit the town. 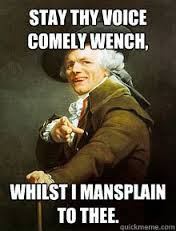 This past weekend I had an uncomfortable experience with a guy who over the span of 3 hours felt the need to pick on me, mansplain to me, and just generally be a creeper. It got to the point where I had to ignore him and as soon as I could, get out of there. I feel that if things had gotten any worse, I would have gone to the organizers of the event. But I am upset at myself because I shouldn’t have needed things to get worse to say something. Sure I pushed back on him when he was being a jerk; I like to think I am a person who stands up for herself and can hold her own in an argument. I’m a smart woman with resources and support. But why didn’t I say anything to anyone who had the authority to remove him? Why didn’t I get up, find my husband, and ask for help? Why did the other people who witnessed his behavior towards me not say anything? Why did I feel like all the harassment wasn’t justification enough? I do know that if I had gone to the organizers or my husband they would have listened to me, so why didn’t I say anything until after I had already left? Now imagine I am your employee and that this was a work event or even a meeting in the office. Imagine that it wasn’t a stranger but my boss, a co-worker, or a client. Imagine that I’m not only a woman but I’m Hispanic. Or a Muslim. Or a gay man. How about a transgender man? What if I was in the closet and wasn’t ready to come out? Or what if I was an atheist but didn’t feel like sharing my personal religious beliefs with others? Imagine that I didn’t feel like people in authority would listen to me, take me seriously, or be willing to help? What if I was afraid that if I did speak out, things would only get worse? 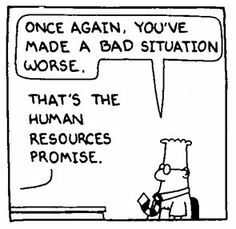 This is a sad reality your employees may be dealing with on a daily basis and you may have NO IDEA it is happening. My one mansplaing jerk being rude to me at an event I voluntarily participated in is an incredibly mild scenario in comparison, no matter how much it upset me. I knew I had support and options and yet I still chose to stay silent and avoid making a scene, no matter how uncomfortable I was. So what happens to your employees who don’t feel they have support or recourse? They suffer in silence, they leave, sometimes they file suit, and sometimes they share their experience with others. And those other employees who made them feel uncomfortable? Yeah, they are still there, doing the same things, and they may not even know that they are doing anything wrong. Any company can say it is committed to diversity and an harassment free workplace. You can put it in your values, write policies, and hold mandatory training. But it takes more than that. Your leadership has to model these values every day. They need to understand that diversity means more than just race. They need to be able to empathize with people different than them and be willing to hold their own teams to higher standards of conduct. And most importantly, your employees need to know and feel that they are supported. They need to know they will be treated with dignity and respect. Your culture absolutely needs to reinforce that. Because you can’t always prevent the jerks from making others uncomfortable, but you can make sure they don’t do it again. 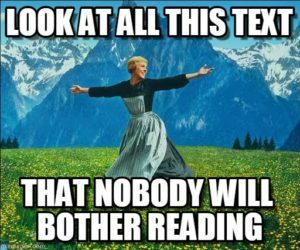 Unless you never hear about it.